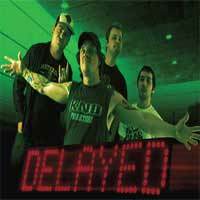 Delayed are a melodic punk rock band originally from Johannesburg, South Africa who are currently based in London, UK. With a humorous outlook on life which shines through in their fast paced energetic stage performance, Delayed maintain a lyrical content that any listener can easily relate to. Having gone through various line up changes, the band reformed in 2008 with Slovakian drummer Phil and recorded there EP title "Cold December" in 2009 at the legendary Stakeout Studios (You Me at Six, Fightstar, We are the Ocean) It breathed fresh life into the band with a new sound and direction, and proved a success in taking them to the next level, with single release "What do you Know" and "Impossible Dream" both gaining radio play and securing them some major slots at venues, gigs and festivals around the UK, Europe and South Africa. Delayed entered Stakeout Studios to record the new album at the end of 2010 and worked relentlessly on creating an impressive and polished new sound! Their debut album, 'Addict' (schedule release date May 2011) has seen much anticipation from fans, and has already proved to be both a critical and commercial success with single release "MTV", prompting radio play and demand for gigs at well known venues across the country, as well as gaining the recent attention of UK and European festival organisers for 2011. With a sound that takes in the old school punk rock tendencies of the early 90's california skate punk scene (think Offspring, Pennywise) all the way through to the more commercially viable and catchy pop punkers such as Blink 182 and Billy Talent, Delayed offer a dynamically infused, fast paced and energetic punk sound along with more melodic, heartfelt ballads and even crossing boundaries with there unique comedic style punk rap anthems. With a now completed line up including recent addition Andy the ?shredder? lead guitarist, a new album, and a new outlook, they are now revved up and ready to set fire on stages across the globe! Nos insertarlos tan pronto como sea posible! !